Awakening: The Deep Sleep is a series of visions the Lord has given Victoria over a period of several years. 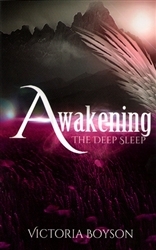 Awakening is an astounding visionary journey revealing the supernatural struggles of the bride of Christ’s release in this hour. You will be captivated as you read of the empowering visions the Lord has given her of Beloved’s courageous quest to liberate the lost and awaken the army of the Lord as she seeks the hidden prophetic host. Truly you will experience the Father’s deliverance and impartation as you follow Beloved through the breathtaking encounters she experiences in this incredible, foreshadowing journey – as she battles for the heart of the church! Dear saints, you truly are the bride of Christ and the celebration of heaven. The world has yet to see your true inner beauty and to feel the waves of piercing glory that will burst forth from your love for Jesus. Victoria Boyson is a prophetic voice to this generation and co-founder of Victoria Boyson Ministries. Based out of the Houston, Texas area, she is called to awaken and prepare the bride of Christ for the end-time harvest and compel His Church to embrace a passionate relationship with their heavenly Father. She is the author of The Birth of Your Destiny and His Passionate Pursuit.